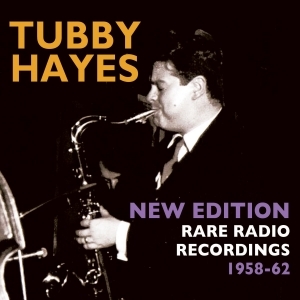 Throughout his all-too-short career, radio broadcast appearances formed a major part of the workload of the legendary saxophonist Tubby Hayes. Barely a month went by without Hayes featuring on the airwaves and this unique collection – assembled to mark the 40th anniversary of his untimely death – contains highlights from his peak years, the late 1950s and early 1960s. Hayes is heard co-leading the famous Jazz Couriers with fellow saxophonist Ronnie Scott and heading his own quartets and quintets including the cream of British jazz. He also featured as a member of the one-off all-star Jimmy Deuchar big band and makes a rare guest appearance with the John Dankworth Orchestra. Featured players include Gordon Beck, Victor Feldman, Allan Ganley, Dizzy Reece, Ronnie Ross and Stan Tracey. Hayes is also heard during his 1962 visit to the America – in blistering form at the Washington Jazz Festival – the only existing live recording of him on US soil. With previously unreleased material – much of which Hayes never recorded elsewhere - and a comprehensive booklet essay by noted saxophonist and writer Simon Spillett, this new collection is the ultimate celebration of a much-missed genius.